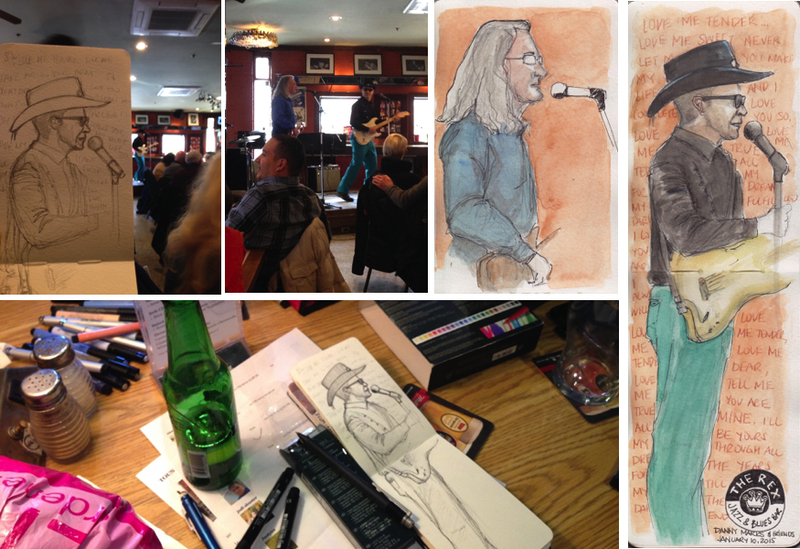 TOUSK started 2015 on a musical note by having its first sketching event at The Rex Jazz & Blues Bar. It's a great little restaurant, walking distance from Osgoode subway station which is perfect on a cold winter day, especially if you're not a fan of the cold. 15 of us gathered in the restaurant to sketch the live bands. The place was surprisingly packed for a Saturday afternoon. I had never been there before and wasn't sure what to expect, but thought it would be a great way to start the sketching year. It was the perfect location to sketch in a warm and fun atmosphere. While we were there, the very entertaining Danny Marks and Friends were playing various classic oldies, including some songs from Elvis Presley and Johnny Cash. It was great to see them interact with the audience, making jokes and taking song requests. It really added to the experience. The second act was from bassist Olivier Babaz and friends, who played cool jazz music and create a nice relaxed atmosphere. Everyone did a great job illustrating the musicians and the happy audience. All and all it was a great session and I suspect we'll be back. I sketched in pencil on location and did the inking and colouring later, below are my sketches for that session. Check out the Toronto Urban Sketchers blog for a sneak peek at the others' sketchbooks.